Do you share responsibility with others to get work done but don't have authority over them — yet their performance reflects on your performance? Do you want to be a more successful team leader or member? Do you want to feel more satisfied in you teams? 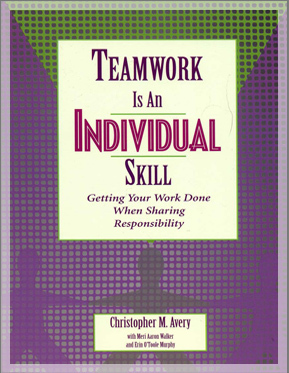 Then read Christopher Avery's Teamwork Is An Individual Skill: Getting Your Work Done When Sharing Responsibility. In it he shares what really builds teams – the same strategies Christopher teaches to the leaders and teams he coaches. Knowing how to take, teach, and inspire personal and shared responsibility is critical, yet few leaders command the mastery of this subject that they could. Indeed nothing good happens — no performance, no learning, no honesty, no correction — until someone takes ownership. And no one communicates the dynamics and intricacies of personal and shared responsibility like Christopher. Christopher Avery, PhD, is a recognized authority on how individual and shared responsibility works in the mind and an advisor to successful leaders worldwide. Learn more about mastering leadership or build a responsible team (or family) from Teamwork Is An Individual Skill and enjoy a more productive way to live and lead. Order from Amazon. Contact us for bulk orders. "I purchased my first copy of this book a number of years ago after it was recommended to me by my MBA instructor. I found it so valuable that in the past 3 years I have purchased additional copies to give to key managers in my organization. Of all the team-building books on my shelf, this one is the most tabbed, highlighted, dog-eared and appreciated. Well done Christopher! You have created a road map to building highly functioning and effective teams. Not just a theoretical volume- real, practical, valuable tools to both challenge yourself and the teams you belong to or lead. It will shift your perspective and allow you to never fall victim to the "I'm on a bad team" blues again. Buy this book- and buy extras for anyone who has struggled with team dynamics. They will thank you"
Fortune magazine dubbed Christopher's classic Teamwork Is An Individual Skill: Getting Your Work Done When Sharing Responsibility the only book on teams worth reading. Here is an excerpt: "Teamwork is an individual skill. That happens to be the title of a book. Christopher Avery writes, "Becoming skilled at doing more with others may be the single most important thing you can do" to increase your value — regardless of your level of authority. As work is increasingly broken down into team-sized increments, Avery's argument goes, blaming a "bad team" for one's difficulties is, by definition, a personal failure, since the very notion of teamwork implies a shared responsibility. You can't control other people's behavior, but you can control your own. Which means that there is an "I" in team after all." "Thank you; thank you; thank you, Christopher. This book is GREAT -- indeed, masterful. Don't walk! Run to get this book! This work adds to the knowledge on teamwork and does so in a way that is practical, easy to read, and easy to imagine applying. Avery has demonstrated his academic research skills, because even though the average reader may not see it, his work is based on knowledge of the latest research. He also demonstrates his long history as a consultant and facilitator in industries right close to home." "I attended Christopher Avery's Knowledge Team Leadership course and came away very impressed with his grasp of Team Dynamics (note that I did not say "team building" with it's touchy feely connotations"). Teamwork Is An Individual Skill is another great tool for companies interested in organizational development. Christopher takes a very practical approach. Just how does one get a group of already successful people who don't have formal authority over each other to come together as a productive team? In today's knowledge economy, time is a precious commodity. Agile, effective teams feel a sense of "shared responsibility" and urgency. If members of a team are not truly committed to a project, it is best to know that up front and adjust accordingly. Christopher shows us how to navigate these issues quickly. This book is well worth checking out."